This new smart lock costs less than some others, but you’ll need to whip out your smartphone to open it. Lock maker Kwikset has quietly added a new product to its Signature Series deadbolt family. It is a single-cylinder motorized deadbolt that supports remote locking/unlocking and packs a ton of connected-home possibilities. The new smart lock is matter-of-factly called theSignature Series Deadbolt with Home Connect, where Home Connect is Kwikset’s preferred way of referring to the use of ZigBee or Z-Wave wireless-networking technologies in its locks. This particular model packs a Z-Wave radio, according to the company. Kwikset says you can use a smartphone, tablet, or any other Web-enabled device to remotely check the lock’s current status, lock or unlock it, and receive alerts each time it’s unlocked. Since all of this is only possible while the deadbolt is connected to the Internet, you’ll need a Z-Way gateway or controller, such as the VeraEdge, SmartThings Hub, or the Wink Hub. Look at the photo above and you’ll notice one thing missing: A numeric keypad. That means you’ll need to pull out your phone to unlock the door to enter your home. Z-Wave support also renders the deadbolt compatible with a wide variety of connected devices including lighting controls, security systems, thermostats, and more. 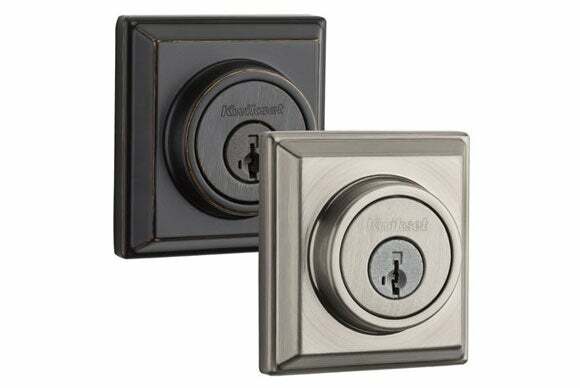 The Signature Series Deadbolt with Home Connect is available in round and square designs, both of which come in a number of different finishes. The lock has a suggested retail price of $150. Why this matters : Smart locks are a great entry point to the connected home, but they typically command premium prices. Dropping the numeric keypad is one way to reduce the cost of these devices.